I’ve been making art now for twenty eight years. My friend Dan who is a professor at Biola University in Southern California sent me recently the photo below. 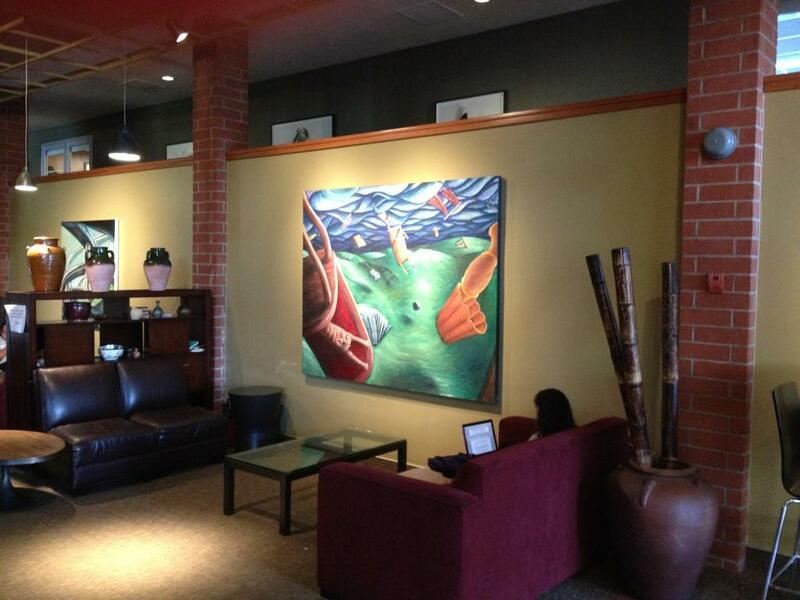 In it you see a painting I created in my junior year at Biola. This work entitled Trials and Tribulations, bubbled out imagery from a series of three 6″x6″ drawings I did called, The Suicide Letters. I honestly can say when creating this work, I fell in love with painting, but also experienced for one of the first times the power of giving voice to a truth by creating a work of art. The painting was originally purchased by a fellow graduate, but after having for about ten years it was donated back to Biola. The alumni’s wife didn’t like the painting as much as he did and no longer wanted it in their home. Trials and Tribulations is now housed as you see here in the student center. When I did the original drawings for this painting at the beginning of my junior year I was struggling with depression, feeling irrevocably broken, alone, and unlovable. Although a follower of Jesus since the age of five, I wanted my life to end and contemplating that I found myself often taking long walks in the graveyard across Biola Avenue. I found solace in talking to the lives of those in the graves. They seem to keenly reminded me that now was my time to live, and as hard as I felt it was for me to keep proceeding, life was mine to embrace. The three Suicide Letter drawings, came out of those conversations. I would exhibit the drawings in a show that the University did in the gym that was a part of an annual holiday extravaganza on campus. During this event I was asked to work on a a large 7’x10′ mural that was going to be placed in the University cafeteria (this mural would be later destroyed by a group of students, but that’s another story…). While I painted, a father of a student came up to me and began talking with me about the Suicide Letter drawings. I was naive enough at the time to think he was interested in buying them. But his comments began to turn with a growing anger and remarks like, “Christians don’t struggle with suicide…” At the time I was flummoxed and didn’t know how to respond so sheepishly commented, “Well, I know people that struggle with that issue….” Of course I hadn’t the courage at the time to say it was MY issue, and I also prior was just thinking to myself that this man may be someone’s nice dad, and it would be nice to have a nice dad… but rather than kindness and empathy I got this parent’s anger and fear. And so this painting did what perhaps art does for many, it provided me a voice. It was a space where I could say that everything is up in the air, and I’m not sure where this is all going, no matter how others judged the chaos I was experiencing. It was a naming. As it graces the walls of the student union at the University now, I can only hope that it some way it says that upheaval is part of the human experience and the Christian experience. It is not something to deny, but to name and in the naming one is able to move beyond that moment to the next. Now is our time to live. This entry was posted in Curious Endeavors and tagged art as voice, bad Christians, Biola Alumni, Biola University art collection, Biola University art department, Christians and suicide, life to live, tornado painting, trials and tribulations, university art collection, Working through pain. Bookmark the permalink. Thanks Tim! I really enjoyed reading this. You give me hope.